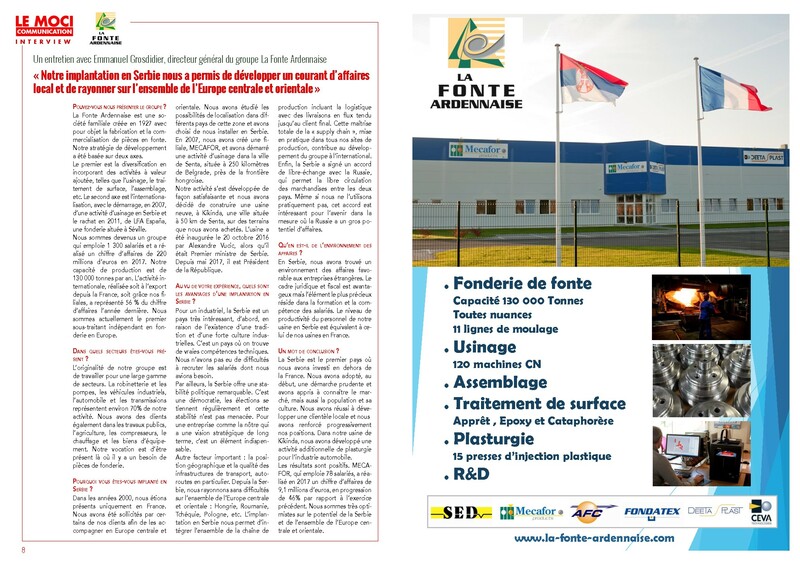 June 2018 - Interview in "LE MOCI"
Can you present us the group? La Fonte Ardennaise is a family business that was founded in 1927 to manufacture and sell cast iron goods. Our growth strategy has been along two lines. The first is diversification by including value-added activities such as machining, surface treatment, assembly, etc. The second is international growth which began in 2007 with machining activity in Serbia and the acquisition in 2011 of LFA España, a foundry in Seville. We have become a group that employees 1300 people with a turnover in 2017 of 220 million euros. We have a production capacity of 130,000 tonnes per year. Our international activity, either through exports from France, or through our subsidiaries, represents 56% of last year’s turnover. We are currently the leading independent foundry subcontractor in Europe. Which sectors of activity do you cover? The originality of our group is to work for a wide range of sectors. Valves and pumps, industrial vehicles, the automotive industry and drive trains represent about 70% of our activity. We also have clients in public works, agriculture, compressors, heating and capital goods. Our vocation is to be everywhere foundry parts are needed. Why did you open a site in Serbia? In the 2000s we were only present in France. Some of our clients requested our support in Central and Eastern Europe. We looked at the possibilities in several countries in that zone and chose to set up in Serbia. In 2007 we created a subsidiary called MECAFOR, and started machining activity in the town of Senta, about 250 kilometres from Belgrade, close to the Hungarian border. Our activity grew satisfactorily and we decided to build a new plant in Kikinda, a town 50 km from Senta, on land that we bought. The plant was inaugurated on 20 October 2016 by Alexandre Vucic, who was the Serbian Prime Minister at the time. He since became the President of the Republic of Serbia in May 2017. From your experience, what are the advantages of a site in Serbia? Serbia is a very interesting country for industrials because it has a very strong industrial tradition and culture. It is a country which has genuine technical skills. We had no trouble at all in recruiting the employees we needed. Furthermore, Serbia has remarkable political stability. It is a democracy in which elections are held regularly and its stability is not threatened. For a company like ours which has a long term strategic vision, these factors are essential. Another important factor is the geographical position and the quality of the transport infrastructure, in particular motorways. From Serbia we can easily travel to all of central and eastern Europe: Hungary, Romania, Poland, etc. Being in Serbia allows us to include the whole production line including logistics with tight flows to the end client. This total control over the supply chain that we implement on all our production sites contributes to the group’s international growth. Finally, Serbia has signed a free-trade agreement with Russia which allows the free movement of goods between the two countries. Even if we hardly use it at all, the agreement is interesting for the future, as there is a high business potential with Russia. What about the business environment? In Serbia we found a business environment that favours foreign businesses. The legal and tax frameworks are favourable, but the most valuable element is the training and skills of employees. The productivity levels of the staff in our Serbian plant are equivalent to those of our French plants. Serbia is the first country outside France we invested in. From the start we were cautious and learned the know the market, but also the population and its culture. We succeeded in developing local clients and gradually strengthened our positions. We developed an additional plastics activity in our Kikinda plant for the automotive industry. The results are positive. MECAFOR, which employs 78 people, had a turnover of 9.1 million euros in 2017, an increase of 46% compared to the previous year. We are very upbeat about the potential in Serbia and in the whole of central and eastern Europe.